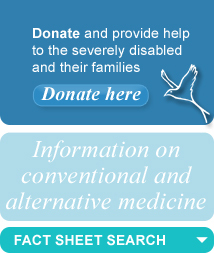 The Resource Centre offers information on conventional and complementary/alternative medicine and therapies and research in relation to a large number of disabilities and disorders. Our data has been gathered from a very wide range of sources and is presented in a straightforward way. We do not make recommendations or favour particular treatments but give you the necessary facts to make choices yourself. What does the Resource Centre cover? The database is constantly growing and we aim to make it as comprehensive as possible. Major topics are documented with cross references to related disorders; available published research is catalogued; names of centres of excellence, details of associations and lists of treatments and therapies are given. How can the Resource Centre help? Whatever the diagnosis (or even if there is no diagnosis) we hope to offer useful, detailed information which it may be difficult to source anywhere else. If you need a fuller picture of a condition, the names of possible treatment centres, the latest research on nutritional medicine, information about new drugs or suggestions for complementary therapies or the names of organisations which can help you further - simply ask us for information. Where is the Resource Centre? Our office is in central London but our service is available nationwide and internationally.